During a time of jarring political polarity and town hall meetings marred by shouts and boos, several top Mormon officials Saturday strongly condemned hostility and hatred as anathema to Christian discipleship. "Someday I hope a great global chorus will harmonize across all racial and ethnic lines," apostle Jeffrey R. Holland said, "declaring that guns, slurs and vitriol are not the way to deal with human conflict." Holland was among more than a dozen speakers who addressed tens of thousands of Mormons in downtown Salt Lake City and millions more around the world, tuned into the LDS Church's 187th Annual General Conference. One voice the faithful didn't hear during the morning and afternoon sessions was that of LDS Church President Thomas S. Monson. The increasingly frail 89-year-old leader presided over the morning gathering after being helped to his seat. In the afternoon, that chair — between Henry B. Eyring and Dieter F. Uchtdorf, his two counselors in the governing First Presidency — sat noticeably vacant. A spokesman for The Church of Jesus Christ of Latter-day Saints said Monson, viewed by Mormons as a "prophet, seer and revelator," was "conserving his energy" for the remainder of the weekend's sessions. Monson has led the 15.8 million-member church for more than nine years; Mormon presidents serve for life. Two years ago, the Utah-based religion announced Monson was "feeling the effects of advancing age." Since then, the longtime LDS leader, who also didn't attend last Saturday's women's meeting, has been scaling back his conference sermons. Other speakers had no trouble preaching with passion about current ills. "Economic deprivation is a curse that keeps on cursing, year after year and generation after generation. It damages bodies, maims spirits, harms families, and destroys dreams," Holland said, decrying poverty and lamenting that "so many around us suffer from mental and emotional illness or other debilitating health limitations." The former president of LDS Church-owned Brigham Young University pleaded with members to stay in the faith's expanding fold. "There is room for those who speak different languages, celebrate diverse cultures, and live in a host of locations. There is room for the single, the married, for large families and for the childless," he said. "There is room for those who once had questions regarding their faith and room for those who still do. There is room for those with differing sexual attractions." In short, Holland proclaimed, "there is a place for everyone who loves God." Fellow apostle Robert D. Hales said as Latter-day Saints follow Christ, "there will be no disparity between the kindness we show our enemies and the kindness we bestow on our friends. We will be as honest when no one is looking at us as when others are watching. We will be as devoted to God in the public square as we are in our private closet." Like the parable of the good Samaritan, true believers "cross the road to minister to whomever is in need, even if they are not within the circle of our friends," Hales said. "We bless them that curse us. We do good to those who despitefully use us. Is any attribute more godly or Christlike?" In the morning, apostle Dale G. Renlund cautioned Mormons against railing on opponents. "We must guard against bigotry that raises its ugly voice toward those who hold different opinions. Bigotry manifests itself, in part, in unwillingness to grant equal freedom of expression," he said. "Everyone, including people of religion, has the right to express his or her opinions in the public square." Renlund, a physician by training, spent his teen years in Europe in the 1960s, where he felt "picked on and bullied" as an American, he said, "as though I were personally responsible for unpopular foreign policies." (Chris Detrick | The Salt Lake Tribune) Elder Jeffrey R. Holland, of the Quorum of the Twelve Apostles, speaks during the afternoon session of the 187th Annual General Conference at the Conference Center in Salt Lake City Saturday, April 1, 2017. SALT LAKE CITY — The LDS Church has a new general presidency for its 7.1-million member Relief Society, and it is unique. Sister Jean B. Bingham was named as the new Relief Society general president after serving for one year in the Primary general presidency, an unprecedented move for a woman leader in The Church of Jesus Christ of Latter-day Saints. The director of LDS Charities, Sister Sharon Eubank, was named first counselor. She will continue in her work directing humanitarian services for LDS Charities. Sister Reyna I. Aburto will be the second counselor. President Dieter F. Uchtdorf, second counselor in the church's First Presidency, made the announcement in the Saturday afternoon session of the 187th Annual General Conference. The new presidency replaces Sister Linda K. Burton and her two counselors, Sister Carole M. Stephens and Sister Linda S. Reeves, who were released Saturday after five years of service. One year ago, Sister Bingham was called as first counselor in the Primary general presidency. Previous leaders have moved from positions as counselors in the Young Women general presidency to become Relief Society general president, but none had made taken that position after serving as s counselor in the primary general presidency. Sister Bingham's moved triggered changes in the Primary general presidency. Sister Bonnie H. Cordon, formerly the second counselor, will become first counselor, and Sister Cristina B. Franco, a native of Nicaragua, will be the new second counselor. Sister Franco is serving with her husband, Rodolfo Franco, as he presides over the Argentina Resistencia Mission. She will assume her new duties when their mission concludes in July, President Uchtdorf said. Sister Bingham, the 17th general president of the Relief Society, is originally from Provo, Utah, but has lived in Texas, Minnesota and New Jersey, according to her biography. Sister Bingham and her husband, Bruce, met when they were students at Brigham Young University. They married in 1972 and became the parents of two daughters and some foster children, her biography states. When the children were older, Sister Bingham returned to her college education and earned multiple degrees in teaching. Her career has included teaching English as a second language, being a nurse's aide, volunteering in her children's schools and serving in various church leadership positions. She also spent six years as an early morning seminary teacher before serving on the general board of the Primary general presidency. In her bio, Sister Bingham said her testimony was greatly influenced by her parents' "faithful examples," church attendance and service. She also has a passion for family history work. In February, Sister Bingham traveled with her new first counselor, Sister Eubank, to the Bidi Bidi refugee camp in Uganda, according to a Deseret News article. Sister Eubank is the first director of a LDS Charities to be called to the Relief Society general presidency. She will perform both roles, according the MormonNewsroom.org. She served on the Relief Society general board from 2009-2012, among many leadership callings. The oldest of seven children in the Mark and Jean Eubank family, she served a full-time mission in Finland. After attending BYU, worked in a variety of professions: She taught English as a second language in Japan, was an aide in the U.S. Senate and owned a retail store in Provo, according to her biography. In the last two decades, Sister Eubank has worked for the Church's Welfare Department and LDS Charities. Serving others is the DNA of church membership and the "heart and soul of the Relief Society," Sister Eubank said in her biography. Sister Aburto and her husband, Carlos Aburto of Mexico, are both converts to the LDS Church. As young woman, her life was changed when she survived an earthquake that demolished her home and killed her younger brother. Her life was also shaped by lessons she learned during a period of civil unrest in Nicaragua during the 1970s. Those two events helped prepare her for a day in 1989 when LDS missionaries invited Sister Aburto to attend worship services. The 26-year-old hesitated at first but decided to go and was later baptized. She has "never stopped marveling at the beauty of the gospel," Sister Aburto said in her biography. Sister Aburto, who served on the Primary general board from 2012-2016, married married Carlos Aburto of Mexico in the Jordan River Utah Temple in 1993. They have two grandchildren. She has studied industrial engineering and computer science and found a career in the language industry. She and her husband own a small translation business, according to her biography. Sister Franco, a native of Buenos Aires, Argentina, joined the church at age 3. What she learned as a child in primary has served her all her life. "I learned that if I had a question, I could ask my father in heaven and I would get an answer," Sister Franco said in her biography. In the late 1970s, Sister Franco's family moved to Utah and her father started a family-owned watch-making business. Sister Franco has worked in the business for nearly three decades. Sister Franco and her husband married in 1978 and have three sons. She brings a wealth of experience to her new calling, having served on the Primary general board from 2005-2010, among many other callings. No leader has ever gone from the general Primary presidency to the Relief Society, but similar moves have taken place in church history. In 2007, Sister Julie B. Beck moved from first counselor in the Young Women general presidency to become the 15th general president of the Relief Society. Sister Bonnie D. Parkin served in the Young Women general presidency from 1994-1997 before she was called as the 14th Relief Society general president in 2002. After serving as second counselor in the Young Women general presidency for two years, Sister Patrica P. Pinegar was named the ninth Primary general president in 1994. Sister Burton became the Relief Society general president at the April 2012 general conference. Prior to her call, she served as a member of the Relief Society general board. During her presidency, Sister Burton championed the "I Was a Stranger" relief efforts several other developments, according to a Deseret News article. Sister Stephens was also a member of the board when called as a counselor in 2012. Sister Reeves was serving as the first counselor in her ward’s Relief Society when called to the worldwide presidency. SALT LAKE CITY -- The Church of Jesus Christ of Latter-day Saints said President Thomas S. Monson was absent from the Saturday afternoon session of General Conference in order to conserve his energy. The leader of the LDS Church attended Saturday morning's session but was not present as the Saturday afternoon session of the semi-annual event got underway. An LDS Church spokesperson tells Fox 13 News Monson is "conserving his energy" but provided no further details. Monson spoke Saturday night at the priesthood session of conference, focusing on a theme of kindness. He said Jesus Christ is the epitome of charity and that his love endures forever, which he said is an example all should strive to emulate. Two more sessions of conference will be held Sunday, one in the morning and the other in the afternoon. In recent years Monson's conference attendance has prompted concerns among LDS Church members regarding his health. In October of 2015, Monson became visibly weak during a conference address. 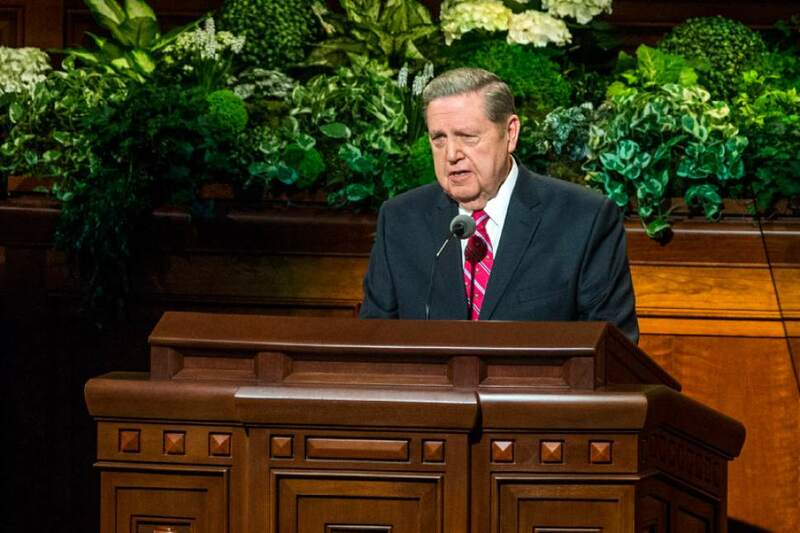 Ahead of the April 2015 conference, Monson reduced the number of talks he was expected to give during the event. At last April's conference Monson gave a shorter message than is traditional during the priesthood session. Monson is 89 years old and has served as the 16th President of the LDS Church since February of 2008. 0 Response to "Mormon apostles speak out against bullying, bigotry, slurs and guns"